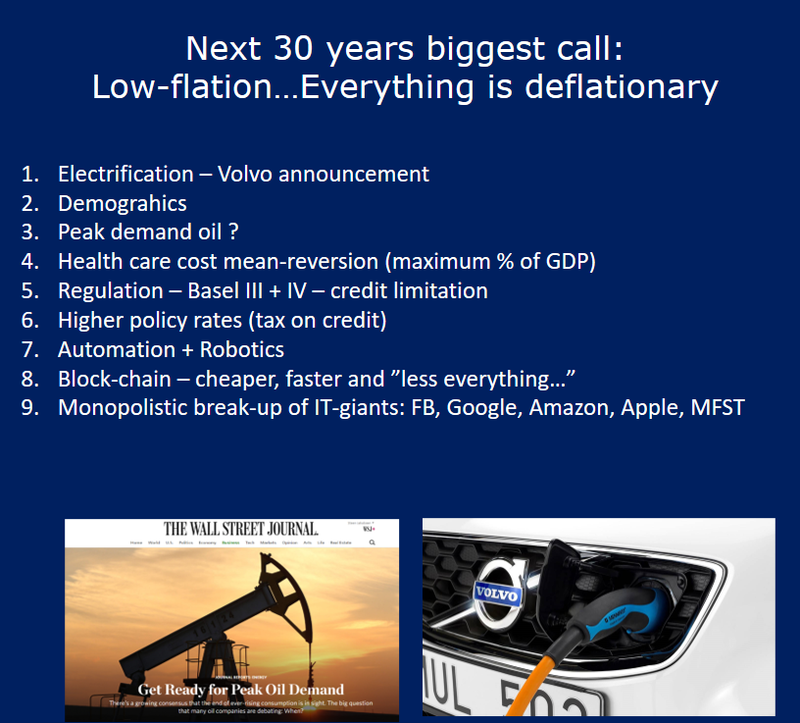 Steen Jakobsen On The Next 30 Years: "Everything Is Deflationary"
Steen Jakobsen, Saxo Bank chief economist and CIO just pinged me with a PowerPoint presentation on the preceding and next 30 years. 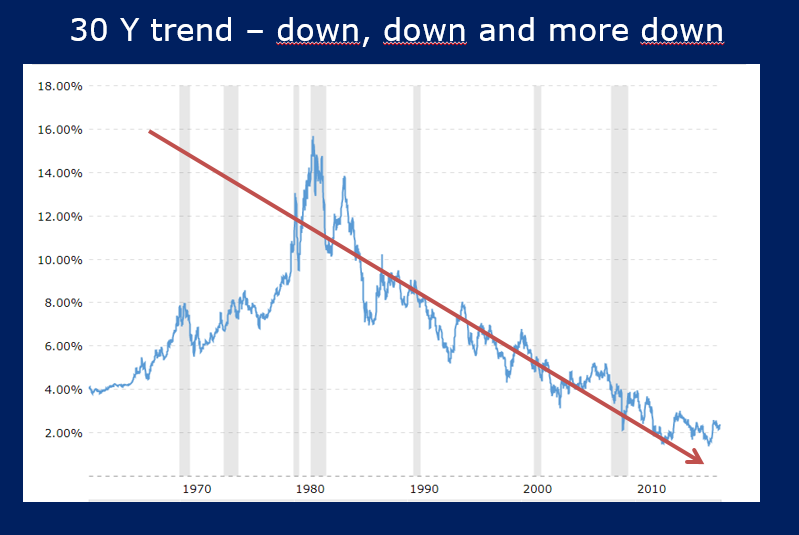 I agree with Steen that the trends are deflationary from a CPI perspective. 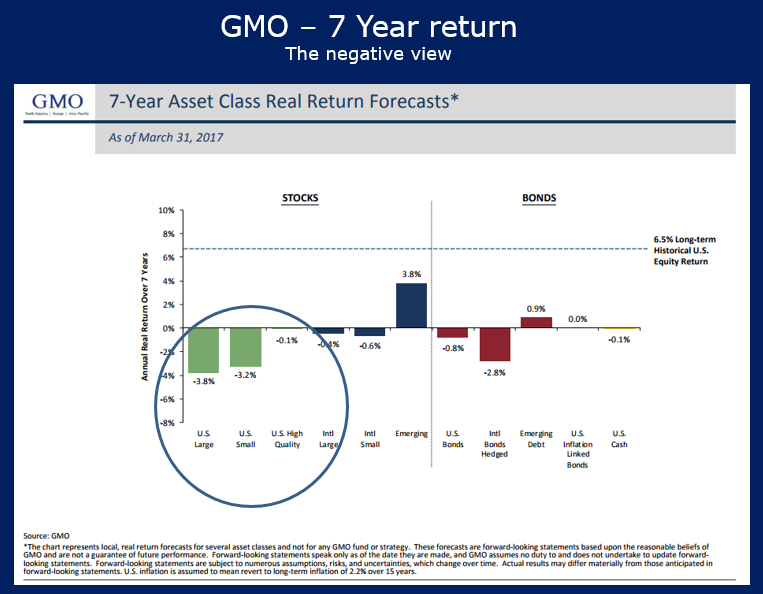 Compare the GMO 7-Year returns estimate to the John Bogle view. I believe GMO has this correct. 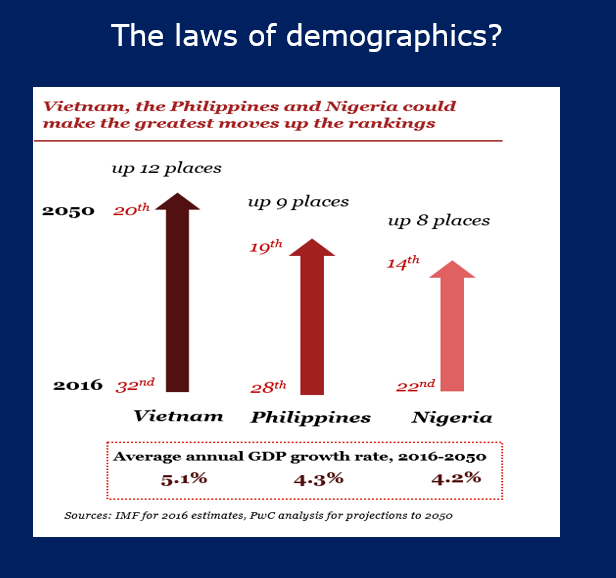 Public pensions are in serious trouble even on the more optimistic view. 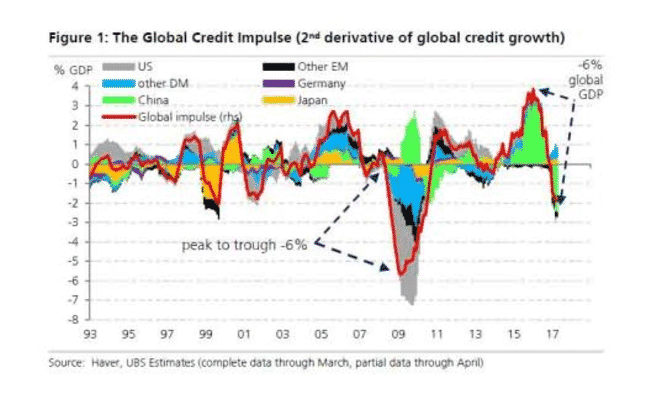 Pay close attention to the global credit impulse chart. Credit impulse is the “Rate of Change of Change” of global credit creation/QE. The Stevens Report discusses the topic in Why “Credit Impulse” Matters to You. There are many analysts and investors who believe that the entire ’09-’17 stock rally is nothing more than the result of a historic, globally coordinated credit creation event from the world’s major central banks. 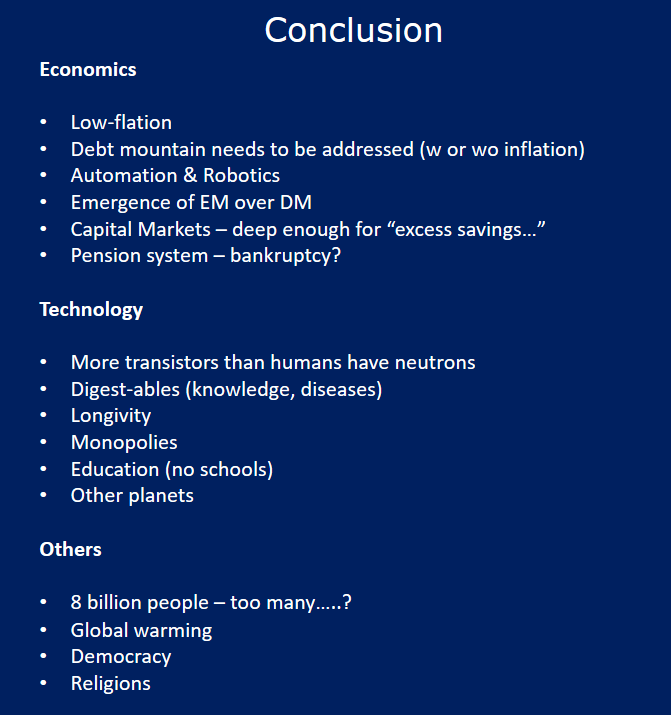 Put in layman’s terms, every major central bank in the world has done QE at some stage over the past eight years, and pumped the world full on cash. So, all they’ve done is create massive asset inflation in bonds, stocks and real estate. While there is no hard proof that this global expansion of credit has powered US (and now global) stocks higher, there certainly is at least a casual relationship if we look at history. The reason I am pointing this out is simple: There are growing signs that the near-decade-long global credit creation/QE cycle appears to be nearing the end. First, there are the central bank actions. The Fed is hiking rates, and likely taking steps to reduce its balance sheet, draining liquidity from the system. Second, the ECB appears to be on the verge of tapering its QE program, and while that will still result in a net credit increase for the next year, the pace of credit creation will slow. Finally, and perhaps most importantly, China continues to aggressively reduce credit in its economy, and I’ll again remind everyone the last time they did that, we got the volatility in 2H ’15. 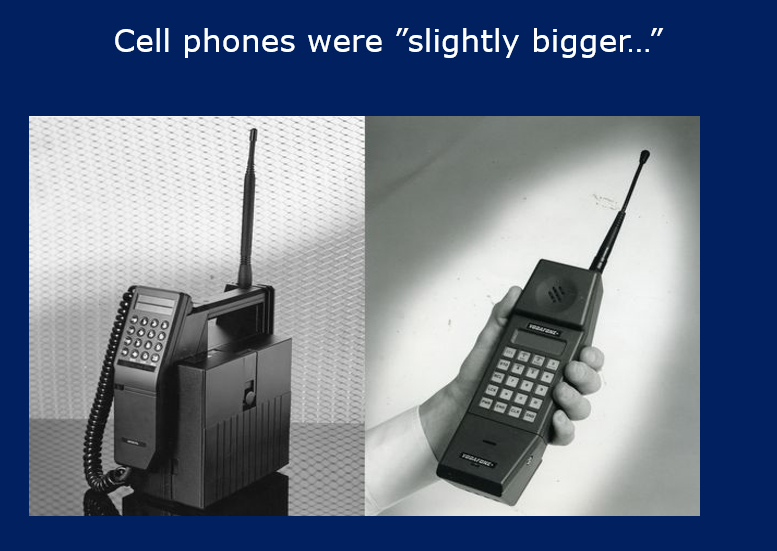 This is where the “Credit Impulse” comes in. Credit Impulse is a term used by various research firms that measures the “Rate of Change of Change” of global credit creation/QE. Put simply, while the global amount of credit may still be rising, the pace of the increase has not only slowed… it’s turned negative. Similar to taking your foot off the gas while you’re still going forward. It’s just a matter of time until you stop. Getting more granular, UBS has been out front on this issue, and back in February noted that Credit Impulse turned negative. 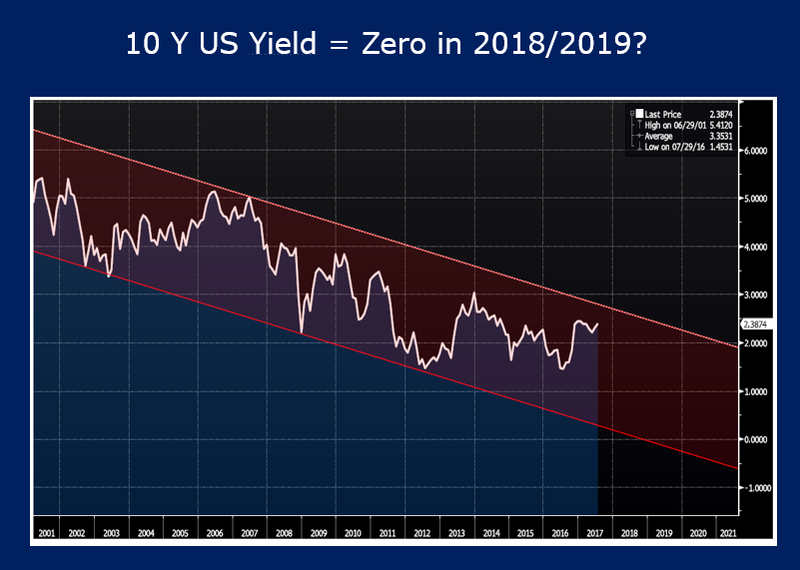 In a much-anticipated report out last week, the firm said that the decline over the past three-to-four months has accelerated, with Credit Impulse dropping to -0.6% annualized over the past three months. Now, Credit Impulse is a composite of various measures of credit, including loans, loan demand, and other metrics, so this is not a hard-and-fast number. 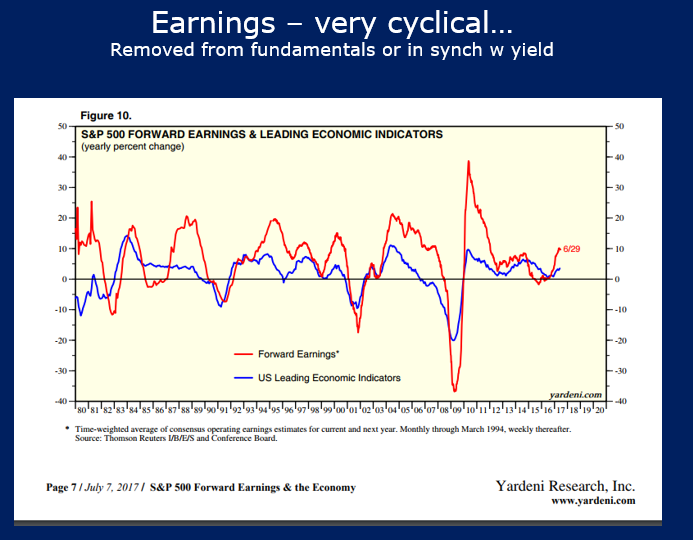 And the fact that it has turned negative doesn’t mean we’re looking at an impending collapse in stocks. But if we look at the entire picture, negative Credit Impulse; a more-hawkish-than-expected Fed that’s apparently committed to reducing its balance sheet, a Chinese central bank that is apparently committed to reducing credit in that economy, and an ECB that will begin tapering QE in 2018… the fact is we appear to be nearing the end of the post-financial-crisis credit expansion, and with economic growth where it is, I cannot see how that will be positive for stocks longer term. 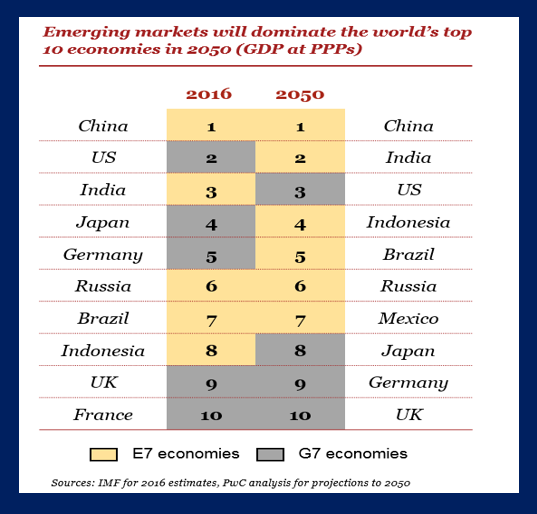 Bottom line, I’m not turning into ZeroHedge (although they are all over this), but the fact is that I sense a lot of complacency regarding the end of this global credit creation cycle. 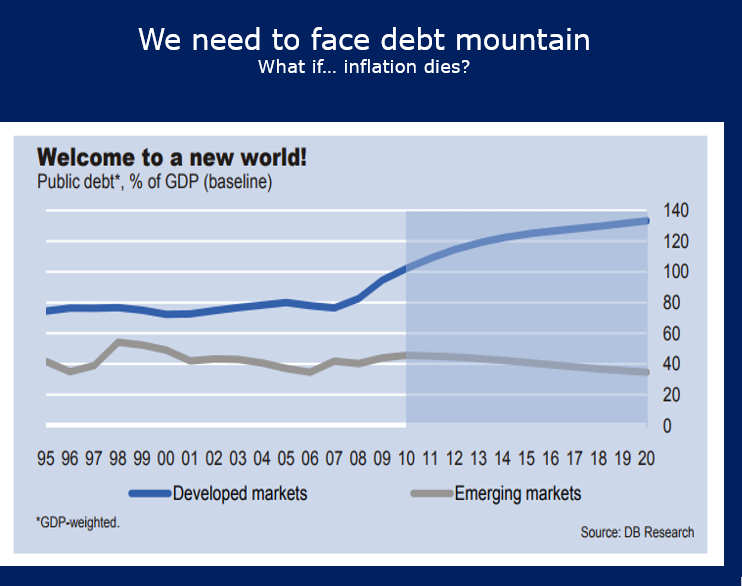 Also consider comments on the Global Credit Impulse by Adam Tooze. In late Feb 2017, UBS’ analyst Arend Kapteyn reported that a measure of global credit impulse covering 77% of the world economy was behaving rather alarmingly. After growing vigorously in 2015 and 2016 thanks to another round of Chinese stimulus the credit impulse had collapsed to zero. Since then the news is worse with the global credit impulse indicator falling earlier this month to negative numbers not seen since the dot.com bubble burst. 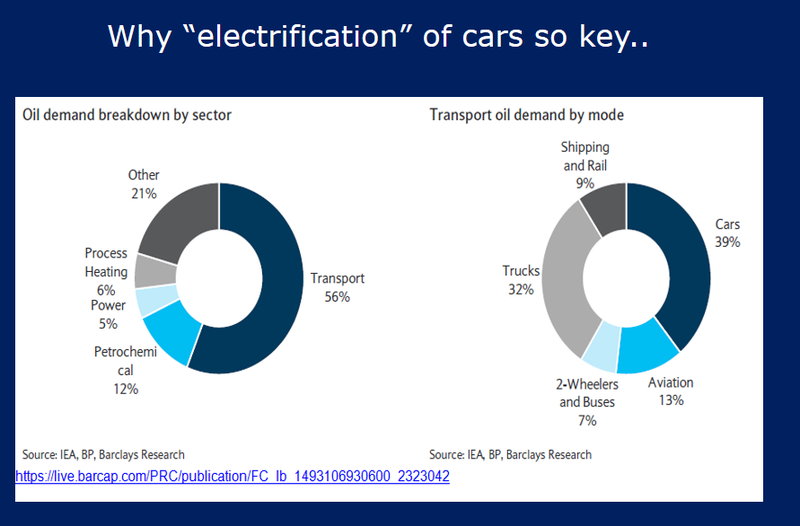 This should be a strong leading indicator of a fall in investment and contractionary pressures in the world economy. 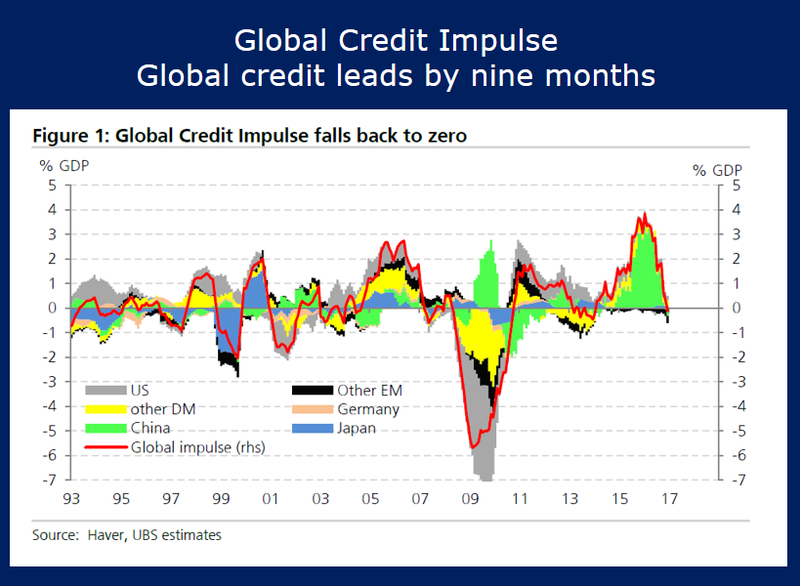 Wrapping up the global credit impulse, ZeroHedge discussed it in Why The (Collapsing) Global Credit Impulse Is All That Matters: Citi Explains. Once again Steen made an excellent presentation. 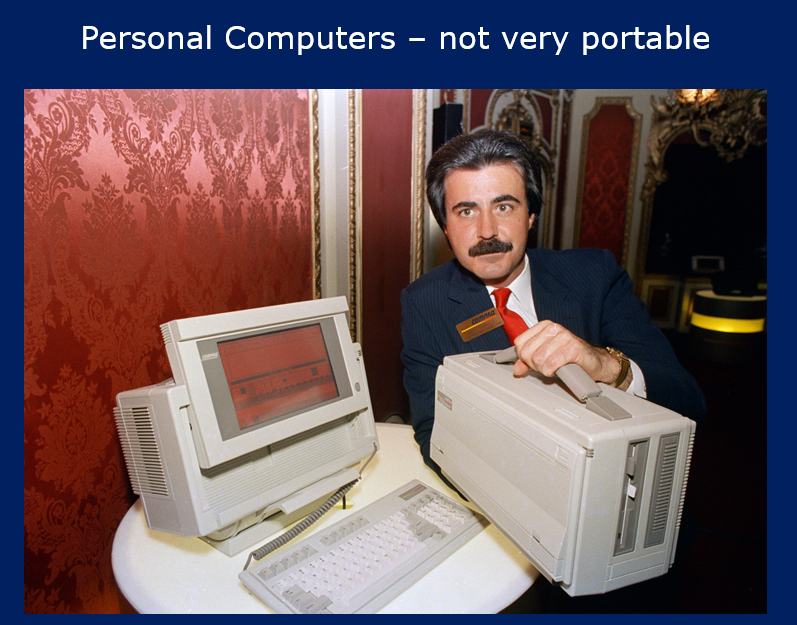 It consists of 28 slides. I used 14 of them. 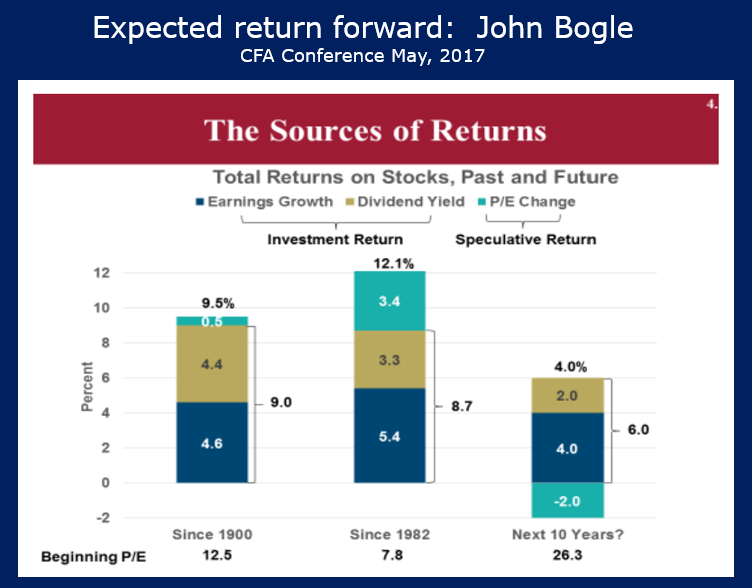 Click on Investment Returns Plus/Minus 30 Years for Steen’s full presentation at the 30th Anniversary CFA Annual Forecast Event, Singapore July, 2017.